Mike, shrap to the core was restless. His keen critical faculty had shown the pitfalls in the fast, stressful, mechanical American life. Born with a silver spoon in his mouth, comforts and luxuries of life were common place for him. They did not lure him. Money, behind each and every action of people around him and the nation, atrocities and exploitations, he was disgusted. Is money the end of all life? His inner man was in turmoil. He had turned insomniac. Neither the way of the tradition-bound church orthodoxy nor the modern free life appeared to give him to solution. Is there a meaning to our lives? Can we, while seeing all these atrocities be still happy and unconcerned? Can we ever think of a harmonious coherent society emerging from this wretched world? The series of questions haunted him relentlessly. He was confused. He was now looking at the insensitive, tribal and rural folks. He recalled 'Ignorance is Bliss'. Maybe, one should not become intelligent and sensitive at all. He envied the restful, peaceful life of these 'undeveloped' people. Why spoil them? Probably we should go back and live a carefree natural life like them. Why all these comforts, the rate race of weapons, the exploitation? These thoughts appeared to give him a direction. Yet this inner man was sensing a flaw in this solution, too. This book tries to answer these questions, the vital ones of life that come up in all of us as developed human beings. The Secret of Action, the Karma Yoga throws light on these aspects of life. This path of Yoga transforms the work arena into the region of growth. In the first chapter ' the inevitability of action' is presented. The second 'towards action', describes the ways to shatter the laziness. 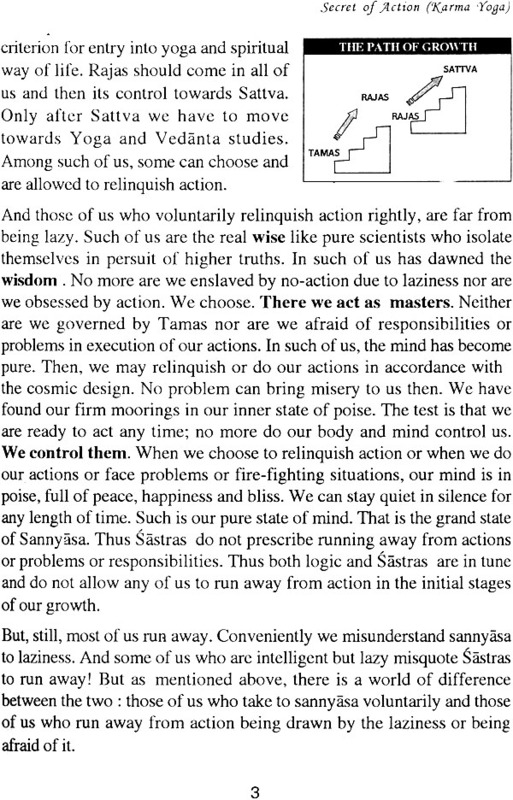 The third describes "the how of action" as the key to understanding the intricacies of action. 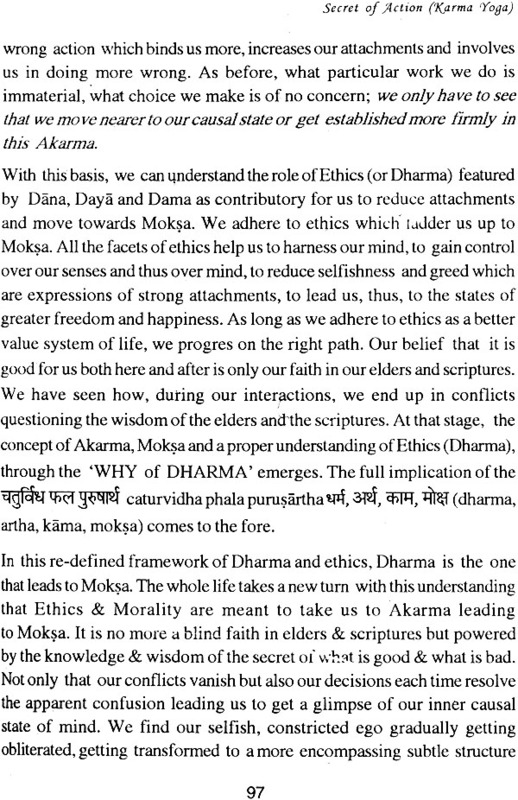 The forth chapter talks about the normally accepted good actions or selfless actions as the very basis of all religions and their limitations. 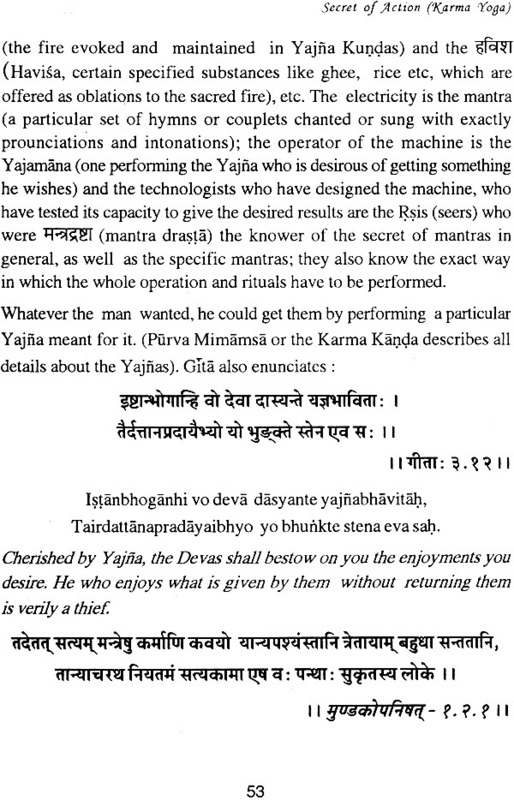 The fifth tries to fathom the spirit of Yajnas-technology of Vedas'. Next the conflicts among such intelligent persons who start questioning the very definition of good and bad, the meaning and purpose of life are presented, The seventh chapter unveils the first secret of action and non-action. The eighth talks about the second secret, purification to bring about the secret 3 and 4 involving higher dimensions of Karma yoga. While the 9th and 10th describe higher deals with conflict resolutions based on this total knowledge-base. 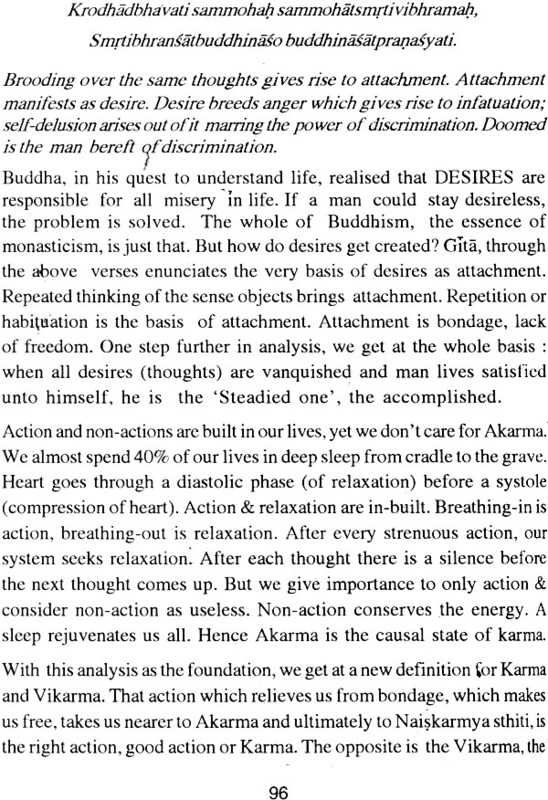 And the last chapter presents a summary of the secret of action and a brief outline of the dimensions of the secret of action. Many have contributed to the contents of the book for whom I offer my gratitude. Prof. A.S.N. Shastry, Sri T. Mohan, Dr. R. Nagarathna, Swami Dayananda Saraswathy, Prof N.V. C. Swamy and Sri H. V. Seshadri are the main persons who brought dimensions of clarity to this work. I could only offer my prayers to them. To Sri Nagendra Jain for correcting the proof and Sri chandrashekar of Sharad Enterprises for bringing out the book neatly in time. 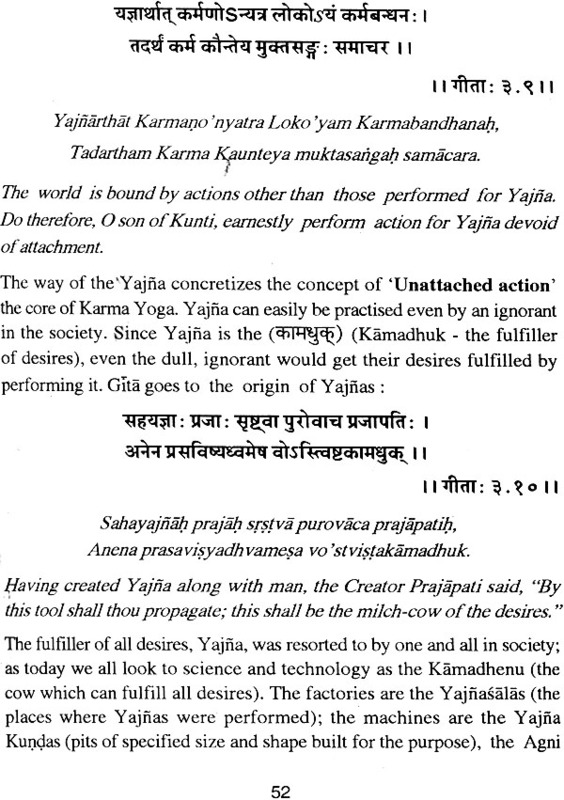 Karma Yoga is a unique contribution of Indian spirituality to the scriptural literature of the world. Hinduism is the only religion which has systematically analyzed action and how to do it. 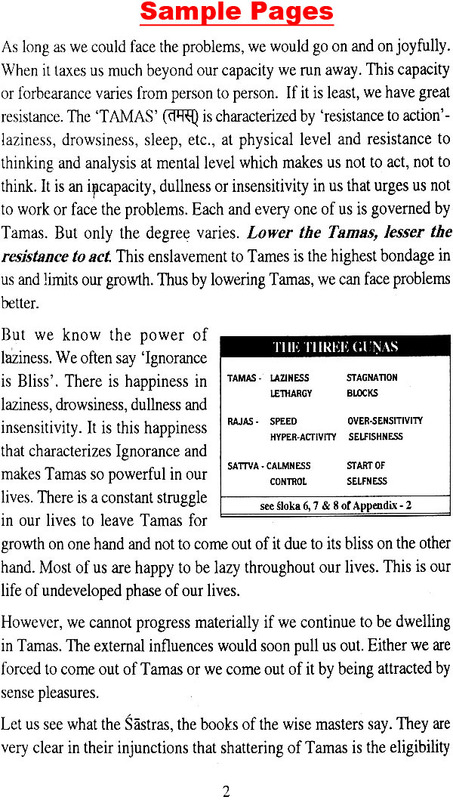 Even in Hindu scriptures, it is the Bhagavad Gita which deals with this subject in great detail. In this sense, Sri Krishna can be considered to be the founder of this branch of Yoga. The first book to be published on this subject was the one, based upon the lectures of Swami Vivekananda in New York and London. 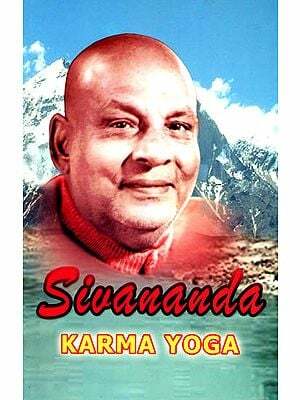 This book has been the reference text since the time for practitioners of Karma Yoga. 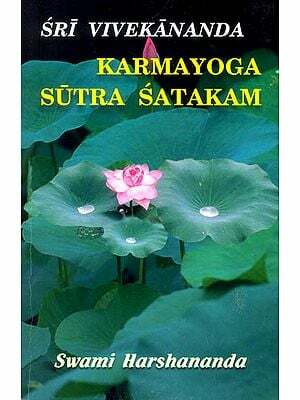 Recently, Sri Ramakrishna Math, Bangalore brought out a publication called Karma Yoga Sutra Satakam', in which Swami Harshananda condensed the teachings of Swami Vivekananda into 101 sutras, followed by commentary. Very recently 'Swami Vivekananda Yoga Publication' published a booklet called 'Notes on Karma Yoga' based upon the lectures given to students of the Yoga Instructors' Course. 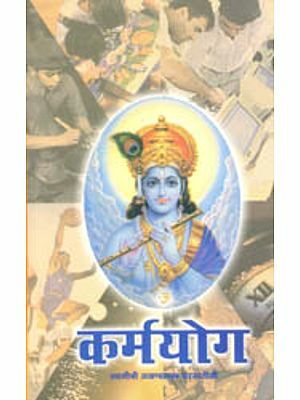 The present publication offers another interpretation of Karma Yoga based upon the teachings of Sri Krishna's teachings in the Bhagavad Gita. It is hoped that the book will be well received by the reading public.